Atomic Blonde was a bright spot in a very lackluster summer. It continues the trend with this release. Providing a complete package of entertainment and escapism that is mastered with the best possible quality. Charlize Theron (Mad Max: Fury Road, Prometheus) has proven herself to be a talented and sought-after actress. She has won numerous awards for her versatile career, including an Academy Award for her role in Monster. 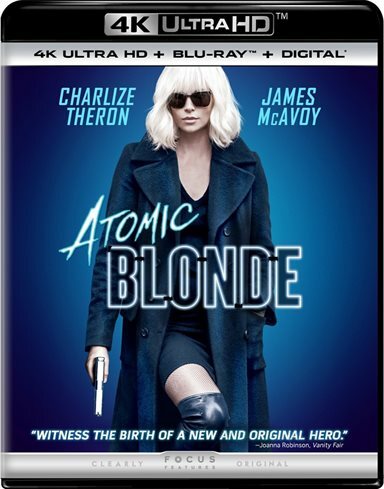 Now, we see yet another side to the actress in Atomic Blonde, due out on Blu-ray DVD, and 4K UHD on November 14th, 2017. Atomic Blonde is based on Antony Johnston and Sam Hart's 2012 graphic novel The Coldest City. The spy thriller stars Theron as MI6 field agent Lorraine Broughton during the Cold War of the 1980s. After another MI6 agent, James Gascoigne, is killed by KGB agent Yuri Bakhtin, Bakhtin steals the list that contains the names of all the active field agents in the Soviet Union. It is now Lorraine's mission to kill Bakhtin and retrieve the list. To say that Atomic Blonde is a "balls to the wall" action movie is an understatement. From the onset to the film's very last scene, the action never lets up. Combined with an amazing 80s soundtrack, an extremely talented cast, a skilled director, and the perfect setting (the end of the cold war), you have the perfect action film. Stuntman turned director David Leitch (John Wick) has created an action picture that is so amazing it should be used as the template for all upcoming action films and probably studied in college classes across the country. Stunts are coordinated down to the most minute detail and easily dethrone the current king of action films, John Wick. At no time do the fight scenes feel choreographed or "fake", and the stairwell fight scene is one for the books that will be analyzed for years by film lovers. It is a "how to" on creating an amazing fight scene. Theron is incredible as an action hero, which makes one wonder why we haven't seen her play one more often. With this film, she has truly elevated herself to the status of the "action heroine" for this decade (easily giving Gal Gadot's Wonder Woman a run for her money). She provides her character, Lorraine, a very tough, "take no prisoners" action persona, while also infusing her with a vulnerability that shows even while she is destroying the bad guys on-screen. Aside from Theron, the film is cast with a plethora of great actors giving their all for this little action film including James McAvoy (Wanted), John Goodman (10 Cloverfield Lane), Sofia Boutella (The Mummy), and Toby Jones (Captain America: The First Avenger). Each one gives Atomic Blonde some of the best performances of their respective careers adding more depth to the film. Atomic Blonde's 4K UHD presentation is one of the best transfer produced to date. Filmed directly to the digital format, the transfer is presented in 2160p HDR with Dolby Vision. Even the tiniest detail is crisp and clear. The video is overplayed with a cold blue hue but that doesn't detract from the HDR color spectrum with all the colors seemingly popping off your television screen. While Atomic Blonde's 4K release does not boast a Dolby Atmos soundtrack, it still contains a very capable one encoded in DTS:X. The dialog is crisp and clear, while the retro 80's soundtrack is very prominent but does not overpower. Welcome to Berlin: A look city of Berlin including film locations and the atmosphere of Berlin in 1989. Blondes Have More Gun: Charlize Theron discusses her role and why she signed on. This feature also showcases the training that Theron had to endure for the role. Spymaster: This feature focuses on David Leitch as a director with cast and crew discussing working with him. Anatomy of a Fight Scene: Director David Leitch discusses all the intricacies of the stairwell fight scene. Story in Motion: A two-part featurette with motion storyboards. Audio commentary with Director David Leitch and Editor Elísabet Ronaldsdóttir. Aside from these features, the 4K Blu-ray set also features a digital copy of the film which ports over to iTunes, Amazon, Google Play, and Vudu using a linked Movies Anywhere account. Atomic Blonde was a bright spot in a very lackluster summer. It continues the trend with this release , providing a complete package of entertainment and escapism that is mastered with the best possible quality. If you are a fan of action films or just a fun two hours, this is a must-own release. Hopefully, with the film's found success, we can expect many sequels in the future.